Planet earth – chill out. There’s so much noise – the sort of persistent buzzing noise that comes from people grating on each other in modern life. More peace for our planet would be a good thing. And I’m talking about the type of peace that occurs when people come together in balance. There may be music, activity and lots going on but within there is a peaceful feeling of serenity. Just over a week ago I attended a festival that was often quite loud with music and lots of people milling about – but it was very peaceful. 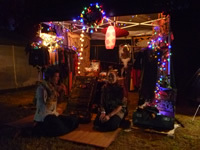 It was the EGA festival held in Australia – Entheogenesis Australia – a four day gathering of people interested in entheogens. Translated as God Within, an entheogen is a psychoactive substance used in a religious, shamanic, or spiritual context. Entheogens, from coffee to Ayahuasca, are mostly derived from plant sources and still continue to be used in traditional religious contexts as they have done safely for thousands of years. What was so wonderful about this gathering was the chill out nature of the people. 800 or so souls gathered for one purpose – to explore the plant medicines. The whole event oozed creativity and imagination and despite the wide diversity of characters there was an acceptance of individuality that created the space for people to be who they are – without pretence or apology. The setup was quite magical with light sculptures and much art. There were four large domed tents for lectures, a healing dome, a sensorium (a chill out place of music and film) food and market stalls. There were lectures by learned ethnobotanists such as Keeper Trout (pictured) and Erowid website publishers Fire and Earth, as well as Ray Thorpe from Happy Herbs. The event was held in a lovely valley in a forest isolated enough so that no one could use any mobile phones. It has been a long time since I have spent four days without once seeing people nattering away on phones. There was a true heartfelt vibe there – not the type of gooey new age or pill popping dance party festival energy; but a settled more focused understanding that comes from a reverence for plants and the role they play in our lives. I believe this sacred feeling we have for such plants and the knowledge of their medicinal properties will grow as more people begin to bring an intelligence to the value of the entheogens. Big thanks to EGA for organizing this truly remarkable event.